Here are more informations on how to use Toonloop 1.x. WARNING: These notes are for Toonloop 1.x, not Toonloop 2.x. 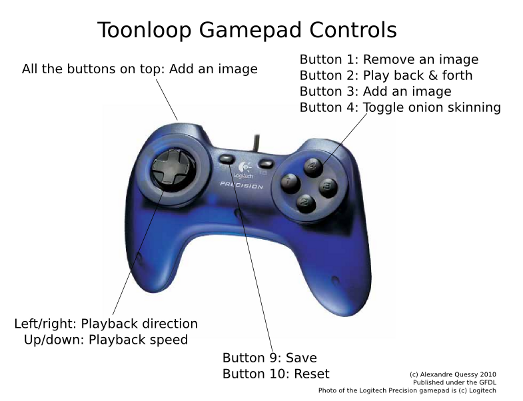 As we do not support anymore Toonloop 1.x, one should read the manual page for Toonloop, and read its source code, in order to know how to use it as an advanced user. In the Developers section, there is a link to the auto-generated documentation of the C++ code. You will need to launch Toonloop with the --enable-joystick option. To do so, you will need to start it using the terminal. On Ubuntu, the Terminal is an application located in the Application - Accessories menu. You can launch Toonloop from there, and specify arguments and options to customize how the software behaves. Try entering the following command, and press "enter". You should see a lot of text in the terminal window. Toonloop should be running. Like most GNU/Linux applications, Toonloop comes with a manual that can be read in the terminal. To read it, simply type "man toonloop" in your terminal window and press enter. 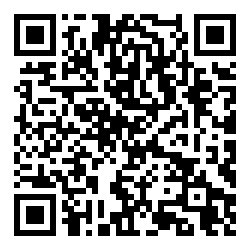 Use the up and down arrow keys to scroll the text. Press Q to quit. The --option command line option allows one to specify specific keyword identified by a keyword. Their type can be integer, float, string of boolean. Boolean options can be given using integer of python-style boolean string. A true value can be specified as True, or 1. A false value is set as 0 or False. Once Toonloop has been started by some keyword config options, those options can be saved to the ~/.toonloop.json configuration file. Next time Toonloop is launched, those configuration options will be read from that file. If Toonloop behaves strangely, you should try deleting that file. Toonloop can be controlled using a MIDI keyboard. It is best used with a sustain pedal. Control #64 seems to be consistantly mapped to the sustain pedal and is set up to add a frame to the current clip. This can be changed using the keyword configuration options which start with "midi". Chroma key is a technique for mixing two images or frames together in which a color from one image is made transparent, revealing another image behind it. The background wall should be of a color such as light green and be evenly lit. See the [[http://en.wikipedia.org/wiki/Chroma_key|Wikipedia Chroma key page]] for more informations. 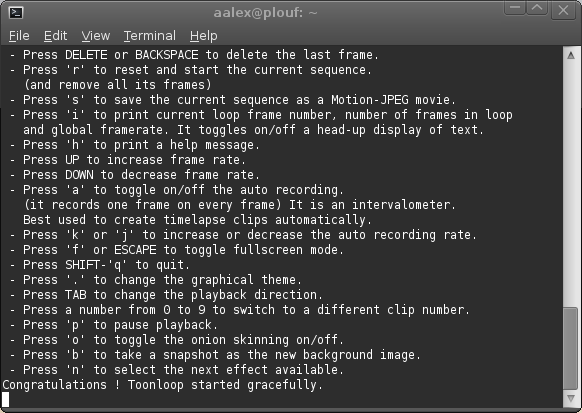 For a green background, Toonloop should be launched with a command line like this.